When you are grinding your teeth or clenching your jaw it’s called bruxism. Many people with bruxism wake themselves up during the night with a loud grating or grinding sound. The sound may even be loud enough that other people can hear it. However, bruxism can also be silent. 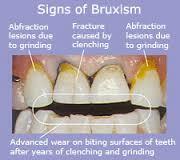 Many things can cause bruxism. Stress, sleep disorders and a bite that is not normal are some of the things that may play a role. What is causing your teeth to grind may not be known for sure. Your dentist can see if you have bruxism by checking for unusual wear spots on your teeth and looking at any related symptoms. Your bruxism can be managed by prescribing an occlusal guard, also known as a night guard to protect your teeth and absorb the impact of your grinding or clenching. Night guards are custom made in the lab from plastic and other materials. 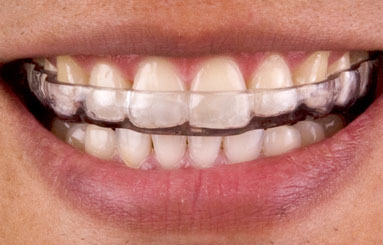 The night guard slips over your upper teeth and prevents them from touching.